Tada! Finally we have reached the final course of my Cooking Games meal, where I cooked six different courses themed after different video games for Tim’s birthday. This recipe is based on a similar ganache to Nuclear Cookie, but with a bit of a difference. However, if it splits, you can use the same tip to rescue it – add a little hot milk. I served these with coffee at the end of the meal, but we kept a few to snack on over the following few days. 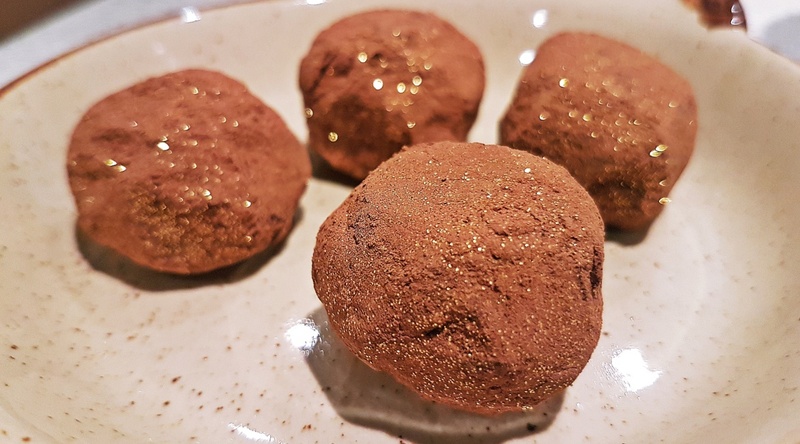 Feel free to experiment with different chocolates (milk, white, or a combo) or even different glitter colours. Just a warning – steps 6 and 7 are insanely messy. Work as quickly as you can, coat your hands in cocoa to stop the ganache from sticking to your hands, and feel free to put the ganache back in the fridge if it melts too much. This recipe makes 10-15 truffles, so feel free to multiply it until you get as many as you want/need. 1. Put your cream into a saucepan and add the brown sugar. Bring it to the boil. 2. Chop up your chocolate and put in a bowl. 3. Pour over the hot sugary cream. Let it sit for 20-30 seconds, then stir quickly until smooth and glossy. 4. Fridge the ganache for at least two hours – ideally more than four hours. 5. Once the ganache is nice and chilled… it’s truffle time! Mix together your pot of glitter with cocoa powder. Vary up the ratio to get the colour effect you want. 6. Spoon out a teaspoon of the ganache. Lightly roll it into a ball shape between your hands – do this quickly, or the ganache will melt. 7. Pop it in the glitter mixture and roll it around to coat it on all sides. 8. Place on a sheet of baking paper. Repeat for the rest of the ganache. 9. Place back into the fridge to harden for at least 15 minutes. 10. Eat before anyone else notices you made them. Have you played Deus Ex? Do these truffles look like they’d fit in?